The picture below shows a Disc Rear Kyoto. Thousands of other top quality spares listed on our website at refreshingly low prices. 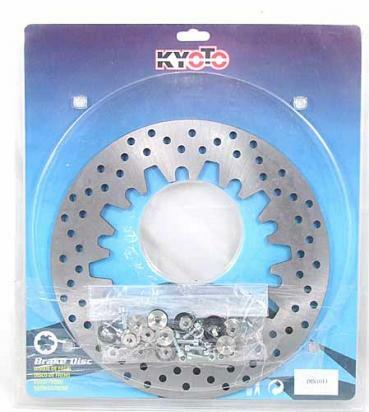 Kyoto brake discs offer optimum style and performance, as well as big savings over original equipment discs. Laser cut from high-carbon stainless steel, each disc provides a wide stopping surface area and high heat dissipation. Like all friction components, Kyoto discs require 'bedding in' - for optimum performance and to ensure a long life for your new disc and pads, you should drive gently and avoid harsh braking for at least 100 miles to avoid damage or 'glazing' the new components.